In Genesis 3, in the perfection of the Garden, we see Satan coming in bodily form to tempt Adam and Eve. 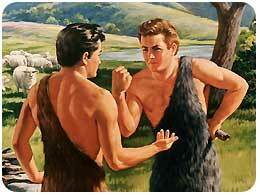 In Genesis 4, after the fall, we see that God warns Cain, “Beware! Sin is crouching at the door, and it’s desire is for you – but you must master it.” Now, sin is physically inside of Cain as an evil force seeking to gain control. This reality of the indwelling presence of sin is the doctrine of Original Sin. Biblically, there were only three people who ever lived without a sin nature: Adam, Eve, and Jesus. And it was only to these people that Satan appeared to temp them bodily. The rest of us have no such need. From the youngest age, we have a traitor within. Long before we could understand words, we know already how to be selfish, cruel and evil. But we know also that these things are wrong, and there is a part of us that wishes to do good – this is the remnant of the Image of God which still lives in us. God does not promise to deliver us from this tension: rather, the tension may grow stronger. As we enter into His family, and His Spirit enters into us and begins rebuilding the shattered Image of God within us – remaking us into the person we were made to be, from the inside out – the actual presence of sin in our hearts aught to decrease, but our awareness of it and our hatred of it to increase all the more. God does not promise us a this-worldly deliverance from this struggle, but rather gives us arms with which to fight it, and promises that “in the temptation, I will give you a way of escape.” (1 Cor. 10:13).